Jonathan and I decided to try to switch up our lifestyle last year and focus on less carbs in our daily meals. That meant getting rid of rice, bread, and sugar. Oh my! It’s really not as bad as it sounds though, there are tons of alternative recipes and hacks to living a low carb lifestyle. 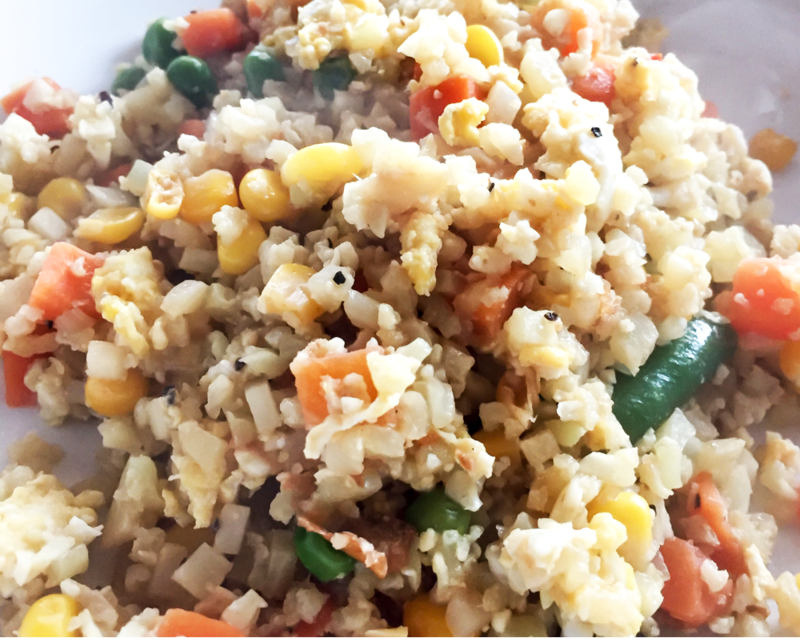 This tasty Cauliflower Fried Rice is an perfect example of a healthy copycat to those takeout containers! Looking for a healthy fix? Pin it to save! Rice is something I grew up eating with almost every meal. It really didn’t matter what, it was always served with rice. So losing rice was a tough one (not as much as SUGAR!) to manage in my dinners but we luckily found a solution pretty quickly: Cauliflower. This versatile vegetable has become a staple in our household. I literally cannot leave the grocery store without a couple heads in my cart. We have come to love creating new and lower carb ways of making our favorite foods with Cauliflower, including this recipe. One night we had a roasted chicken (Costco rules!) for dinner but I wanted to pair it with a side of veggies (as we do almost every night) so I thought about some fried rice. 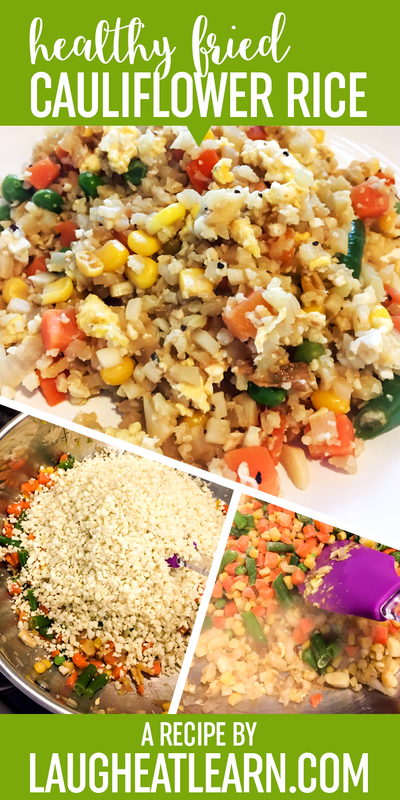 I had all the ingredients in my fridge and freezer so I got to work with cracking the egg first, adding the cauliflower last, and enjoying the takeout flavors without having to order anything over the phone! Begin by heating a deep pan with 1 tablespoon sesame oil on medium. Once you begin to smell the sesame oil, it's ready. In a bowl, add your eggs and whisk together with pinch of salt & pepper until mixed. Pour the mixture in your pan and scramble the eggs, continuing to stir in pan until they are almost cooked through. Remove the eggs and reserve on plate. Add the remaining tablespoon of sesame oil and heat as you did before. Once ready, add the garlic, shallots, and ginger, cooking for 2-3 minutes until slightly soft. Continue to stir. 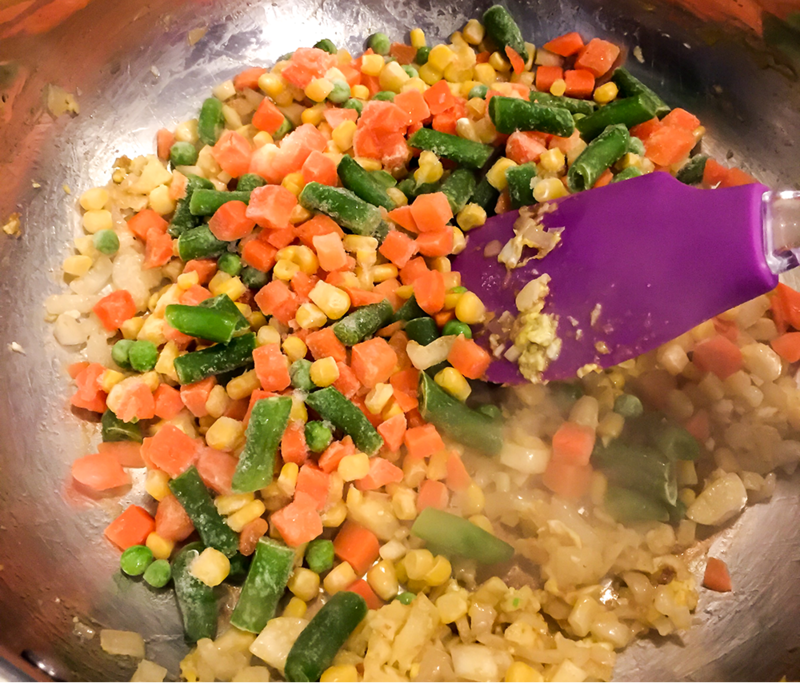 Add the bag of frozen vegetables directly into your pan with the garlic mixture. Stir and cook through the veggies, about 5-6 minutes. Lastly, add in your riced cauliflower to your pan and stir into the mixture. Cook for 4-5 minutes max. You want to just heat the cauliflower, not cooking it all the way through. Add the egg back in and taste for seasoning. Remove from heat and portion on plates, grab your chop sticks (or don't, that's okay too! ), and ENJOY! I've noticed that most grocery stores are now carrying "riced" cauliflower. You can usually find this in the veggie section, near the prepped food areas.